You know me by now, I think, if you read here often. I get obsessed with a project or a tool or a technique and am not happy till I feel like I have exhausted all the possible uses. And often, if I am obsessed with more than one thing, I’ll do a bit of a mash-up. The results are not always a success but in this case I think it is. 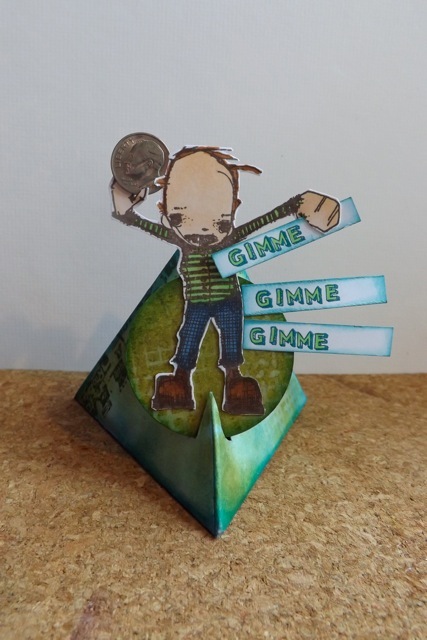 I had so much fun making the little Gimme Gimme Gimme bank from Petrina’s template. 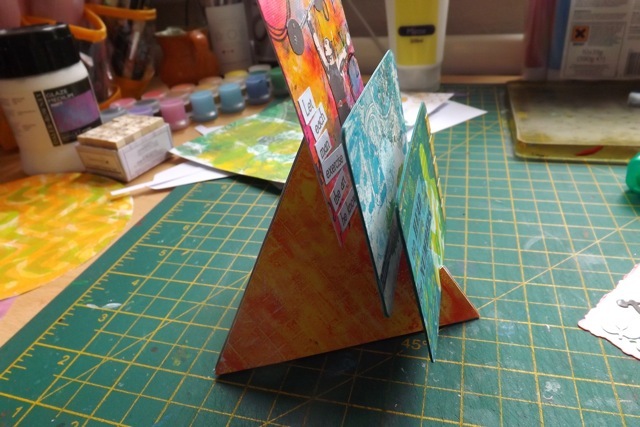 I had said to her that my original idea was to use it as a bit of a display stand for ATCs. My thinking was that it would be a nice little thing to have on my desk to display ATC trades. Not that I am really likely to need it till the 5th Anniversary of WOYWW, as I don’t do ATC trades regularly. 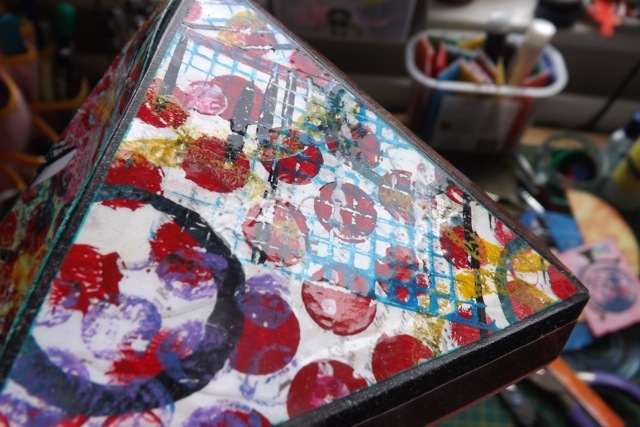 I have been considering taking part in the ATC trail on UKS so who knows…. And there is one more use that I need to work out a sample of. Decide what you want to make. I think it’s pretty obvious what is needed for each option, but I’ll try to mention which bit is needed for which version in the steps. 1. Print the template. Cut out the elements. What you see is the BACK of the of the project, or at least that is how I think it is easiest to do it. 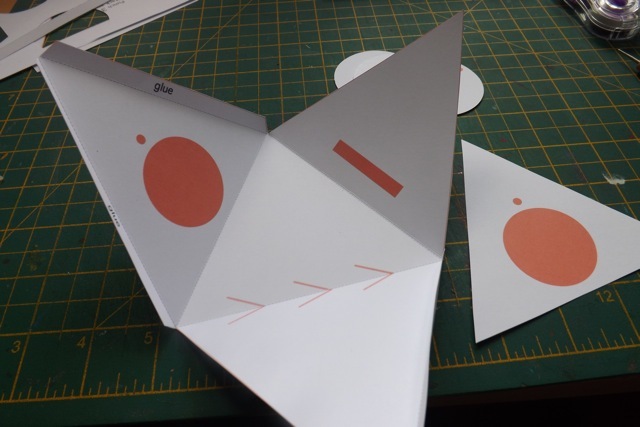 The instructions tell you to punch three of the circles, and you should be able to do that from the non-template areas of your printed template. Only one circle is printed. 2. Score the lines and fold as VALLEY folds. This puts all the printed areas INSIDE. 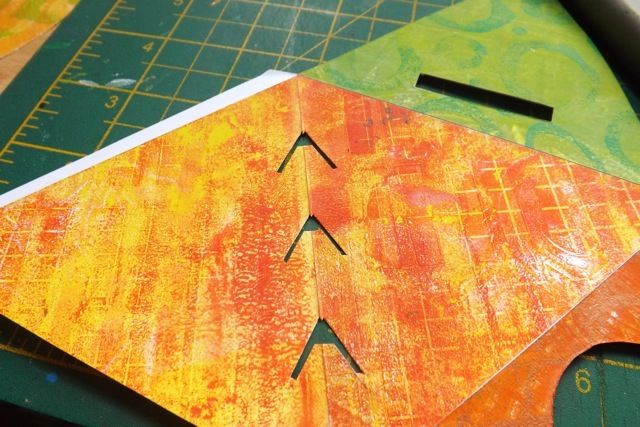 This would be handy if, for example, you wanted to print the template on the back of a Gelli print, or cardstock or patterned paper – or if you wanted to decorate with inks and stamps, like the bank seen in detail here! 3. 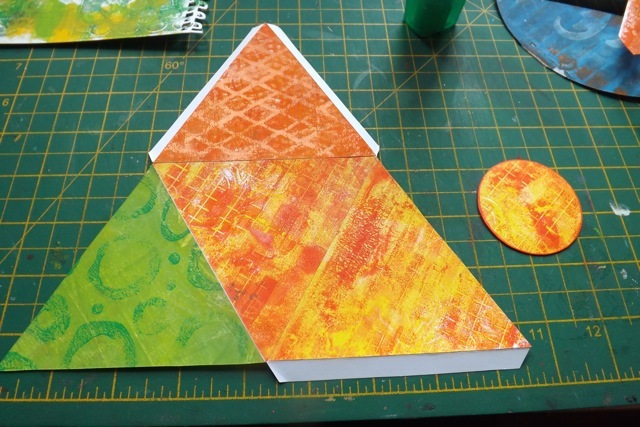 FOR A BANK ONLY: Stick the extra triangle to the inside of the BASE. Stick the 3 circles in a stack. 4. 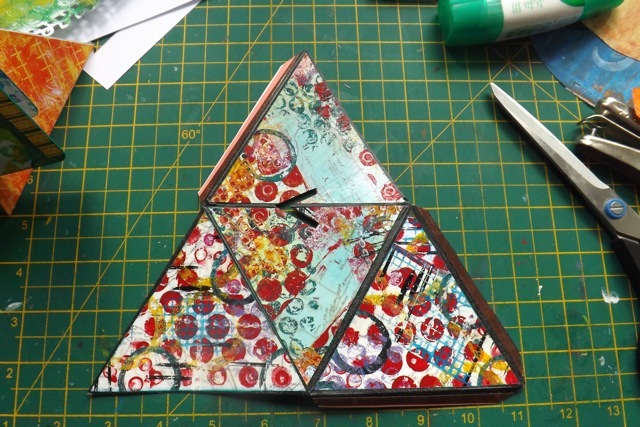 Decorate the various triangles. Note the two that make up the FRONT. If you want to coordinate them, or decorate them so they are views as one area, your can. 5. FOR A BANK ONLY: Cut out the circle and the coin slot. Again, if you plan on making this just as a display stand, don’t make the cuts! 6. 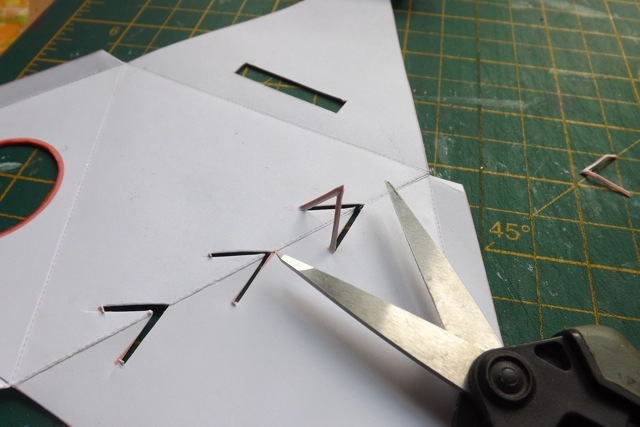 FOR A DISPLAY STAND ONLY: Cut the display notches. Also, you can choose to cut just one, just two, or all three of them, as you prefer! I am not sure about this step! 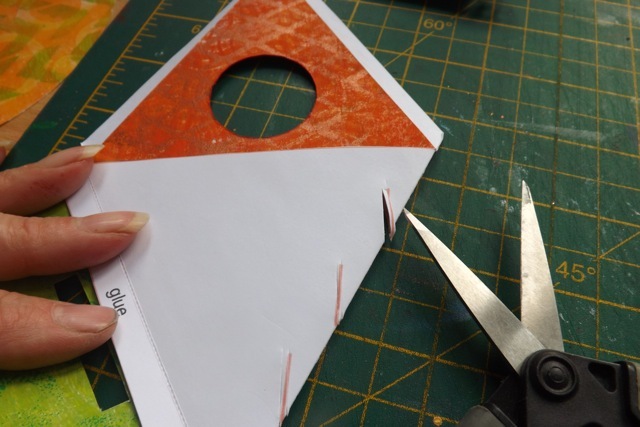 I snipped off the point of the triangle, thinking it would make it easier to slip in whatever you will display. But I am not sure it’s an improvement. 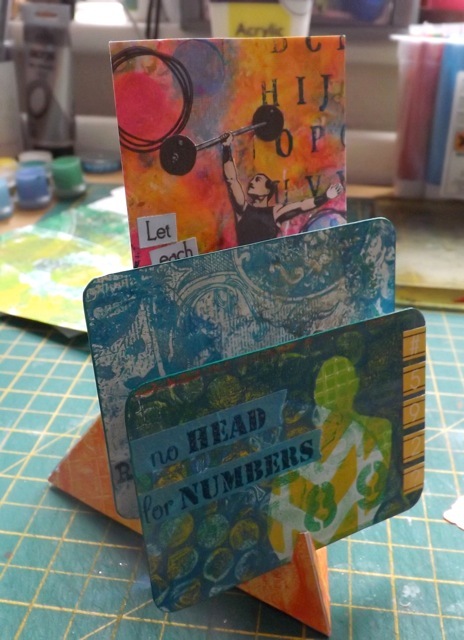 Some of my ATCs are quite thick, and for them, it helps, But super thin ones, it’s less of an improvement. Think carefully which will be more useful for you. 7. 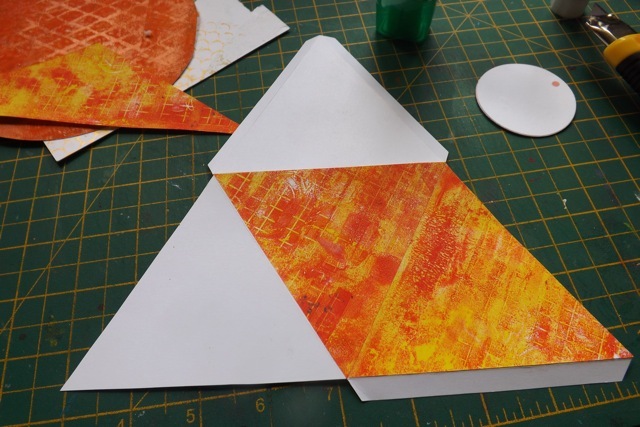 If you want to, you can alternatively either cover the triangle with Gelli print pulls on the sticky side of contact paper OR stick those pulls to whatever paper you want then cut them to decorate just like the ones above. 8. 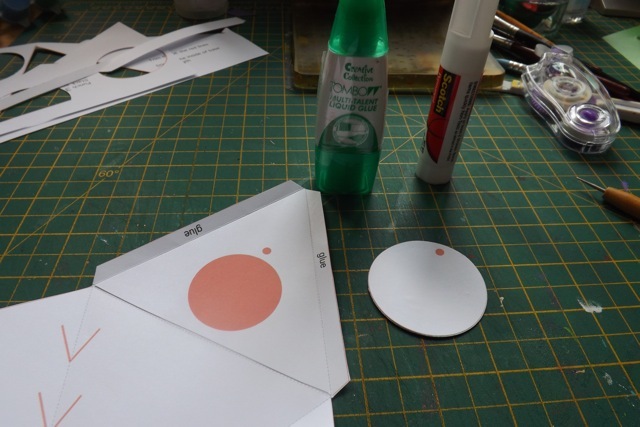 FOR A BANK ONLY: attach the circle stack to the base, over the smaller hole, with a brad. That will allow you to rotate it out of the way and get the money out! 9. 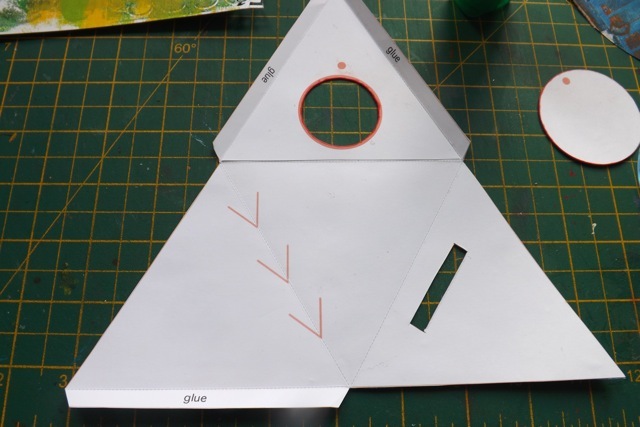 Although the template will say GLUE on the INSIDE of the flaps the adhesive goes on the BACK OF THE FLAPS so you can stick it together on the inside. You can see the position in the photo above. I probably could have milked this for about 4 days worth of blog posts, but it made more sense to me to show all the variations at once – that way if one doesn’t appeal, another might! 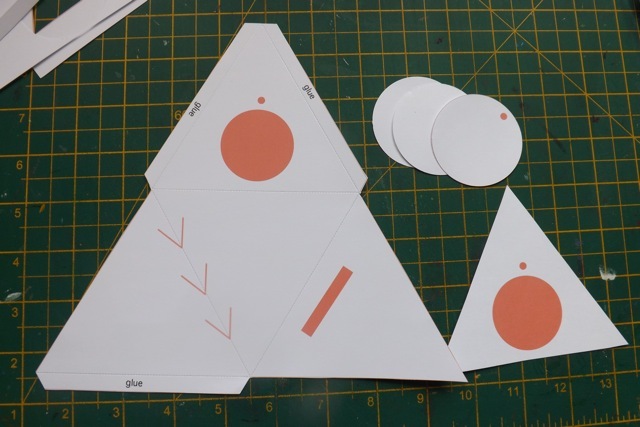 I had the thought too that this might be adapted to make a “card” – or at least something that is a card as much as the display stand one is a CARD, IYKWIM. The issue is that you have to be super confident in your recipient! will they take the time to assemble it? Unless yo are sure, it’s just not worth the time. But I have a bit of an idea for that too…. If you made it all the way thru, well done. I have a gazillion other things I could say, but I won’t. It may take another post or two after all….. 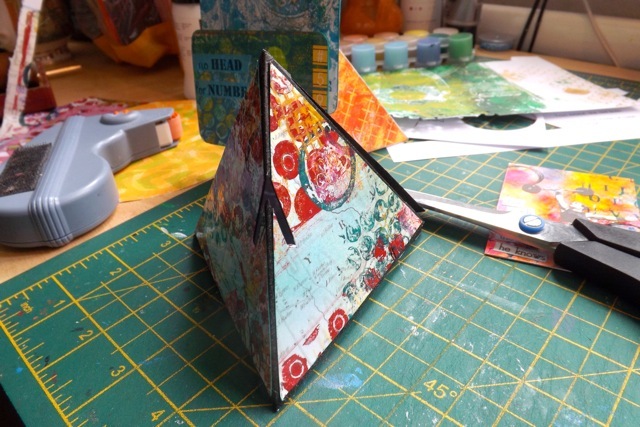 Categories: Gelli plate monoprints, paper sculptures, tutorial | Tags: Gelli, Gelli plate, how-to, paper sculpture | Permalink. Wow…wow. This was so cool looking and such a great display idea. I hope to get brave enough to try it myself soon. I am linking this one on my blog because if think it’s so Fab! Thanks again for this great tutorial! What a great ideas and tutorials. I particularly like the display stand. Looking forward to seeing what you come up with next! Okay, now this I have to try! Thanks for the awesome tutorial! 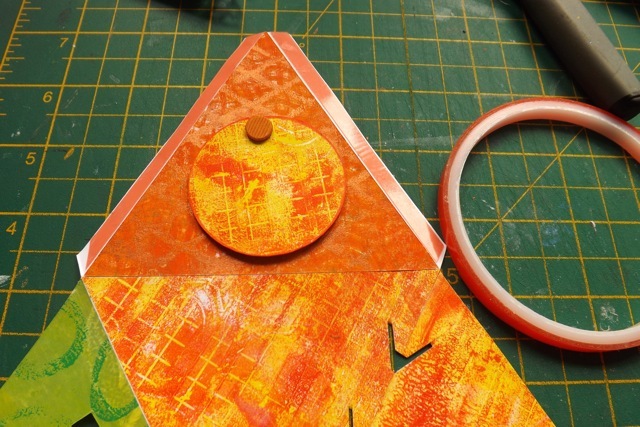 Great way to use your Gelli prints! In love with your orange prints! So glad you shared this with the party! Some people are SO talented. Keep up your Passion! super cool! I love the height of this project. It’s so different from anything I’ve seen. Excellent! Your art is beautiful. 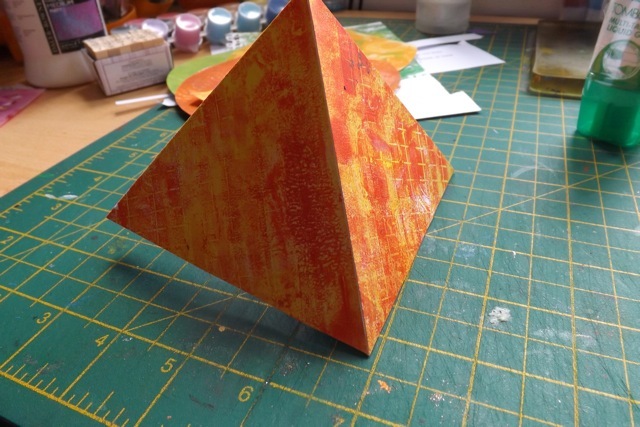 The pyramid display stand holds a lot of business cards…so if you are doing any shows or exhibits it works well. It may hold a greeting card but I have not tried that yet and you have that worked out with your super card tower…just so clever.